The Bayeux Tapestry is an 11th century embroidery depicting the Battle of Hasting, the 1066 battle between the invading French-Norman army, led by William the Conqueror and the Anglo-Saxon King Harold II. Both men had a claim to succession on the English throne, it was given to Harold, after he betrayed William the Normans invaded England to claim the throne. The tapestry is in very good condition despite being commissioned in the 1070’s CE (The Original Bayeux Tapestry). This piece of art is generally considered a good historical source. It was made, and finished, within 20 years of the event in question, increasing the validity of the depictions. Furthermore, it is widely accepted by historians that Bishop Odo, cousin to William, commissioned the piece. This validates the events shown in the tapestry due to his presence and participation in the battle itself. However, there is evidence of tampering on the tapestry. There are holes and fade patterns that indicate pieces have been unstitched and altered. The most infamous example is the arrow that killed Harold. The tapestry, as it is now, shows the King being shot in the head with an arrow, however, accounts say that in the original stitching he was impaled with a lance. “He was constantly striking down the enemy at close quarters, so that no one could approach him with impunity, for straightway both horse and rider would be felled by a single blow. So, it was at long range, as I have said, that the enemy’s deadly arrow brought him to his death (Medieval Sourcebook: William of Malmesbury, d. 1143? : The Battle of Hastings, 1066)”. The tapestry shows evidence of unstitching around the arrow, leading many to believe that a lance was originally depicted killing Harold and was later changed to an arrow, thus complicating the validity of other scenes. Bayeux Tapestry. Circa 1077, The Bayeux Museum, Normandy, France. Panel 69 is near to the end of the battle of Hastings, just before Harold is killed. The panel contains part of an inscription that reads: Here the French fight and those who were with Harold fell (Rud, 86). There is a noticeable influence of both French and Saxon in the Latin, this suggests that both Normans and English worked on the embroidery (Bouet and Neveux). Along the bottom, archers, and along the top (left at right) are what is possibly a peacock, a griffin, two lions, and an eagle. It is likely that each represents something. Owen-Crocker, specifically noting the birds in the tapestry, says “Often they echo what is going on in the main frame… Although birds are often used in the Tapestry to illustrate and comment on human situations, sometimes, conversely, it is as birds per se that we see them (252-253)”. Here the tide of battle is in favor of the Normans and the animals depicted along the top border may accentuate that. Symbolically speaking, a peafowl represents immortality, while a Griffin is the King of all Animals, often symbolizing Christ and holy aide. Lions are for kings, in this panel they are facing opposite to each other, this could be symbolic of the opposition between Harold and William, as both had a claim to the throne. Last is the eagle, which is a divine guide or messenger (Boehm and Holcomb). Bouet, Pierre, and François Neveux. “Latin Inscriptions.” Everyday Life – Bayeux Museum, Bayeux Museum, Oct. 2013, www.bayeuxmuseum.com/en/les_inscriptions_latines_en.html. “Medieval Sourcebook: William of Malmesbury, d. 1143? : The Battle of Hastings, 1066.” Internet History Sourcebooks, sourcebooks.fordham.edu/source/1066malmesbury.asp. The Normans Arriving at Pevensey Bay — The Bayeux Tapestry. approx: 1070-1080. The Bayeux, Normandy. “The Bayeux Tapestry scene39.jpeg” Wikimedia Commons. Accessed 11/25/2018. This scene from the Bayeux Tapestry shows William’s men sailing across the English channel and arriving on the shores of Pevensey Bay. The arrival took place on September 28. Normally, local watchmen would be keeping watch over the seas, detecting invaders, if any. Fortunately for the Normans, however, was that members of the “fyrd,” (farmers by trade, though part of Harold’s militia) had abandoned their posts to tend to their harvests, as it was September. Thus, William and his men were able to land relatively easily. Though not spotted by watchmen, the men did not arrive entirely undetected: local landowners witnessed the arrival and their reports reached Harold three days later (Rud 67-68). The ships on the left of the image are shown traveling across the channel. Evident by the straining sails in the artwork, the wind was at the backs of the Normans. Though perhaps not as glorious as the tapestry depicts, there was almost certainly strong wind on the waters. The English channel is notoriously unpredictable between states of strong wind and silent calm. These same winds also chased away King Harold’s navy from the location. Where the Normans should have met resistance from the navy, they found empty waters, as Harold’s ships were being repaired of damages sustained in tumultuous waters (Rud 66-67). While this entry describes scenes not included in my panel, it confirms that Duke William was able to land in England with some element of surprise. Had the previously mentioned fyrds been attentive to their posts, perhaps William’s arrival would have been met with resistance and therefore changed the course of the invasion. Page from the Worcester Chronicle (Anglo-Saxon Chronicles D) —- The Introduction To The Annals, In The Worcester Anglo-Saxon Chronicle. British Library, http://www.bl.uk/onlinegallery/onlineex/illmanus/cottmanucoll/t/largeimage75452.html. Accessed 11/25/18. When using this artwork as a historic source, it is important to take into account the perspective of the creators. Even without knowing who embroidered the linen, one could tell that it tells a story of William gloriously conquering his rightful throne and removing the dishonorable Harold. That alone would reveal bias for William’s actions. The nature of the embroidery itself invites multiple interpretations of the scenes depicted. In fact, the Latin text here and there on the artwork are the only forms of narrative offered (Milbrandt, Bonds 26). “Battle of Hastings.” Wikipedia. Wikimedia Foundation, 23 Sept. 2017. Web. 25 Nov. 2018. Milbrandt, Melody K., and Katrina Bonds. “Instructional Resources: Violence in Art: Raising Authenic Issues for Discussion.” Art Education, vol. 53, no. 1, 2000, pp. 25–32. JSTOR, JSTOR, http://www.jstor.org/stable/3193859. Rud, Mogens. The Bayeux Tapestry and the Battle of Hastings 1066. Christian Ejlers, 2002. Translated by James Ingram. The Anglo-Saxon Chronicle. Champaign, Ill. : Boulder, Colo. :Project Gutenberg ; NetLibrary, 19901999. Print. Wilson, David M. The Bayeux Tapestry: The Complete Tapestry in Color. New York: A.A. Knopf, 1985. Print. The Bayeux Tapestry is an embroidered work what follows William the Conqueror’s conquest of England in 1066 AD. William used the Norman army to invade England in order to regain the English throne from Harold. Harold had taken the throne after the former king of England, Edward the Confessor, had died without an heir. The piece is nearly 70 meters long and consists of nine conjoined strips of linen that have been embroidered with only 10 colors of thread. It may have been longer, but it is speculated that the final scenes have been lost. It was likely commissioned by Bishop Odo, William’s half-brother. The tapestry has a more Anglo-Saxon style of stitching than French, and was probably not made in Bayeux at all. This is supported by Old English characters in the writing on the tapestry (Lewis). The validity of the tapestry as a source for the events of William’s conquest is questionable. Embroidery is not the clearest art form and can be easily misconstrued, the text that appears on the tapestry is limited and often abbreviated. The tapestry also focuses mainly on events in England, leaving out many details of events that took place elsewhere (Lewis). This panel depicts a violent battle including many dead and broken weapons. It was uncommon to depict the dead in a piece like this. The latin text over this scene reads, “Regis: hic ceciderunt simul Angli et Franci in prelio”, which translates to “Here fell the English and French simultaneously in battle”. This battle scene likely represents what is known as the Malfosse incident (Wilson). The Malfosse incident was a disastrous charge by the Normans through English lines into a trap where many soldiers and horses were killed. The English were positioned on a hill and faked retreat, tricking the Norman cavalry into charging their horses into concealed spikes (Wilson). There is debate as to whether the animals depicted in the borders of the tapestry are directly related to the scenes that occur above or below them. Figures in the top border of panel 65 include lions and griffins, these may just be there to take up space or they could represent something symbolic about the scene. The bird that appears in the top border of section 65 is a dove carrying an olive branch, this is often used as an expression of peace (Owen-Crocker), this seems to be quite unrelated to the bloody battle that occurs below it. Lewis, Michael J. “Questioning the Archaeological Authority of the Bayeux Tapestry.” Cultural and Social History, vol. 7, no. 4, 2010, pp. 467–484. Owen-Crocker, Gale R. “Squawk Talk: Commentary by Birds in the Bayeux Tapestry?” Anglo-Saxon England, vol. 34, no. -1, 2005, p. 237. Wilson, David M. The Bayeux Tapestry. Christian Ejlers Publishers, 2003. The Bayeux Tapestry is said to be made up of degreased wool and nine pieces of linen that were treated by alum to ensure the dyes would stay before it was spun (Bloch 494). The other colored parts of the tapestry were dyed thread in addition to the dyed wool. Upon examining the Bayeux Tapestry, some parts of the colored areas wasn’t as faded as the others. This means that some parts of the Bayeux Tapestry weren’t exposed to sunlight as much as the others. It was also discovered with Carbon-14 dating that tapestry borders and central panels were embroidered after the tapestry was hung between the fifteenth and seventeenth century (Bloch 494). Considering the timeline, it was believed that the tapestry was made between and after the conquest, resistance, or revolt (Bloch 493). Some professors find the Bayeux Tapestry an interesting topic and due to the timeline not having an exact timeline, they created assignments for students to research if the tapestry was made between or after the conquest, resistance, or the revolt (Carter 31). “William Rides To War – Scene 3.” The History of Britain’s Bayeux Tapestry, Britain’s Bayeux Tapestry, 2014, http://www.bayeuxtapestry.org.uk/Bayeux25.htm. With the description provided, William, Duke of Normandy, would be on the red horse and the mace in hand. This picture is suspected to be William the Great’s army heading into the Battle of Hastings of October 14th, 1066 (Carter, Historians 24). With the new battle in the horizon, William’s army of calvary was terrified of King Harold’s army, not confident in their formation, and recollecting that no Norman’s ever being a King of England (Tanton). Seeing this as a huge weakness, William raised his mace and rallied his men. With the battle cry and in the scene provided, it seems to have helped his men recollect their spirits and rush into war (Tanton). King Harold’s army was composed of infantry and filled with archers. With the mobility of riding a horse and disciplined training, William the Great’s army overpowered King Harold’s and he became the first Norman King of England. On the tapestry, there is a crow on the top right corner pointing to King Harold’s army. I believe this signifies his ill fortune and death. Without William’s speech to his troops, I believed they wouldn’t have won due to having a poor mentality. Bloch, R. Howard. “Speculum.” Speculum, vol. 81, no. 2, 2006, pp. 493–494. JSTOR, JSTOR, www.jstor.org/stable/20463736. Carter, John Marshall. “Doing What Historians Do: Using the Bayeux Tapestry to Discover the Past.” The Clearing House, vol. 70, no. 1, 1996, pp. 24–25. JSTOR, JSTOR, http://www.jstor.org/stable/30189228. Carter, John Marshall. “Writing Games in the Bayeux Tapestry.” The English Journal, vol. 74, no. 7, 1985, pp. 31–34. JSTOR, JSTOR, www.jstor.org/stable/817592. The Bayeux Tapestry. approx: 1070-1080. The Bayeux, Normandy. “The Bayeux Tapestry scene62.jpeg” Wikimedia Commons. Accessed 11/20/2018. The full sentence at the top of this section of the tapestry reads “Hic Ceciderunt Lewine et Gyrd Fratres Haroldi Regis,” or “Here fell Leofwine and Gyrth, brothers of King Harold.” The name Gyrth is spelled with a Nordic D on the tapestry and is therefore thought to have been written by an Anglo-Saxon. This section depicts the start of a second phase in the battle, where the English infantry led an attack along the entire Norman front. The soldiers in the tapestry can be seen carrying javelins and spears, as well as sticks, stones, and axes. Leofwine, brother of King Harold who died later in the battle, is believed to be depicted near the center of the panel, wielding an axe with his head turned. To the right of Leofwine, an English soldier is stabbed in the face by a Norman cavalryman’s spear. This is believed to be Gyrth. We know that both men were killed on October 14, 1066. Both Leofwine and Gyrth were earls back in England, Leofwine over Buckinghamshire and Surrey to Essex, and Gyrth over East Anglia and Oxfordshire. Together the brothers controlled almost all of east England, which would have made them fairly important figures at the time, but very little is known about them besides what we can deduce from the tapestry. One of the only sources to mention them by name, William of Malmesbury, says that Gyrth tried to persuade King Harold not to lead the English army against William of Normandy, and offered to do so himself so that his brother could remain in London to lead their people. Harold refused, and he was subsequently killed in the battle along with Gyrth and Leofwine. When using the Bayeux Tapestry to learn about history, specifically as an account of the Battle of Hastings, one must keep in mind that it was likely made to celebrate the victory of William of Normandy. 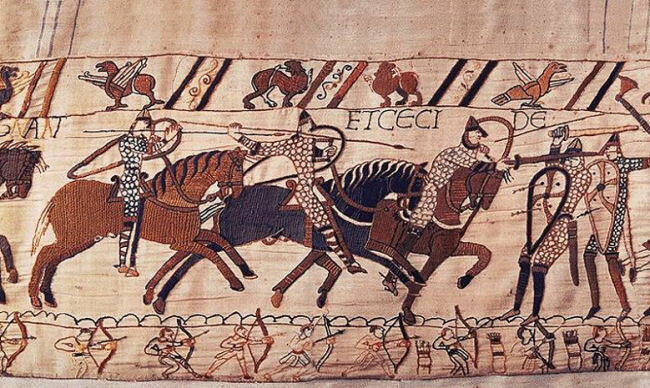 Accounts of war are told and remembered from the victor’s point of view, and the lack of detailed English records at the time make the Bayeux Tapestry one of the only, and by far the most detailed, source of knowledge about the Battle of Hastings. “Battle of Hastings.” Wikipedia. Wikimedia Foundation, 23 Sept. 2017. Web. 20 Nov. 2018. “Gyrth Godwinson.” Wikipedia. Wikimedia Foundation, 7 May. 2018. Web. 20 Nov. 2018. Gameson, Richard. “The Authority and Interpretation of the Bayeux Tapestry.” The Study of the Bayeux Tapestry. Rochester, NY: Boydell, 1997. 89. Print. The Bayeux Tapestry is thought to have been made in England for William’s half-brother, Odo. Odo happened to be the bishop of the Bayeux -hence the name of the tapestry- and Earl of Kent. Speculators believe that the tapestry was made in Canterbury in a workshop that was associated with St. Augustine’s Abbey (Laynesmith). comes to this scene in the Bayeux Tapestry. Before diving in though, let me explain the difference in the soldiers. Historically, King Harold’s army was almost entirely infantry with the exception of a few archers. The Normans, on the other hand, were about half infantry, a quarter cavalry, and another quarter of archers (Battle of Hastings). Because of this, we can figure out that any of the horses in the tapestry (There is only one, in my case) are part of the Norman cavalry. The second figure also seems to match up with the story given by John Middleton. After being shot in the eye, he wandered into enemy lines and was slaughtered. The tapestry is indicative of that, except for the fact that the arrow is missing from the figure’s eye. However, if you look closely at the second figure’s head, you will see that there seems to be missing stitches leading to the second figure’s head. Why were the stitches put there, and why were they removed? These are both critical questions that unfortunately can’t be solved, and further deepen the mystery into figuring out which figure is the real King Harold. An attempt to try and analyze the location of the title a certain figure also fails, because the title, “Harold Rex Interfectus Est,” stretches above both figures, “Harold” being closer to the first figure, and “Interfectus est” being closer to the second figure. In my own speculation, I think that it is very possible that both of the figures could be King Harold. It is somewhat apparent that the -most likely Anglo-Saxon- artist(s) did not know how to divide the different scenes, therefore making it look like the Normans were attacking themselves in some part of the tapestry. I think that this is another one of those situations. If my speculation is true, it shows that Harold was shot in the eye, and then immediately after was killed by the Norman cavalry. This opinion is supported by David Bernstein, who was the first to point out the missing stitch marks leading to the second figure’s head (Bradbury 207). Here we can see people stripping the valuables off of the dead soldiers and peddling their newfound loot for money. While there seems to be no other source that mentions this happening after the battle of Hastings, it seems likely that it did happen. There are some problems when it comes to using the Bayeux Tapestry as a source though. There was an absolute bias of the art itself. The embroidery was made with the idea of showing the victory of William the Conqueror and his army, and was probably made for Bishop Odo, who was William’s half brother. Also, because of the lack of worded description on what the artist was trying to convey, it is mostly up to the artist to interpret what actually happened during the Norman conquest. That is disadvantageous because of people’s variance of views and opinions. As mentioned before, the embroidery doesn’t offer us 100% accuracy of exactly what happened, or at least we can not assume that. However, it does bring a resourceful and interesting perspective of what did happen. We may never know which figure was supposed to be King Harold. Bradbury, Jim. The Battle of Hastings. Sutton Publishing. 1998. pp. 206-207. Laynesmith, J. L. “A Canterbury Tale.” History Today, vol. 62, no. 10, Oct. 2012, pp. 42–48. EBSCOhost, hal.weber.edu/login?url=https://search-ebscohost-com.hal.weber.edu/login.aspx?direct=true&db=aph&AN=82392810&site=ehost-live. Much folklore has been developed around the title of King Arthur; indeed, he is a chief character in much medieval and modern literature (some of my personal favorite modern nods to him include “The Buried Giant,” by Kazuo Ishiguro, the character Saber, a.k.a. Arturia Pendragon, in the Fate anime series, and a single obscure episode in the third season of Babylon 5, in which nothing remotely significant to the plot ever occurs). However, the bulk of this work tends to be very fanciful, growing more so the further the source is displaced from the approximate period of Arthur’s life. It is natural to wonder what the earliest sources say about Arthur, as these should (logically) carry the most accurate and reliable information. Below, we investigate some of the early records and events popularly associated with Arthur, in an effort to determine the likelihood of his existence. Providing the most relevant context to the time when Arthur’s actions would have been current events, as Gildas was most likely a Briton, this text will get most of our attention. Additionally, this work is highly politicized, near impossible to date, and gives no direct reference to King Arthur, limiting the use we can make of it. The connection with King Arthur is found through the account of the Battle of Badon Hill, a battle generally connected to Arthur for reasons discussed below. As mentioned, Gildas doesn’t mention Arthur in his commentary on the Battle of Badon. 12th century hagiography claims that “Gildas had praised Arthur extensively but then excised him completely after Arthur killed the saint’s brother, Hueil mab Caw.” (Wikipedia). In Concepts of Arthur, Thomas Green theorizes that the events of that battle were so well known that describing them in greater detail would have seemed a triviality (Green, 2007). However, it is somewhat difficult to believe that Gildas would have failed to comment on a monarch he disapproved of, considering the nature of the rest of his writings. The Battle of Badon has significance because the encroachment of the Anglo-Saxons on the Celtic Britons was halted as a result of it. This decisive victory was accomplished by a united force of Britons, which implies that they had some sort of leadership, at least militaristically; their military leadership was purported by later sources to be Arthur, though he was clearly not “King” Arthur at this time, as Gildas refers to Ambrosius Aurelianus (see right) as the organizer of this force. (Korrel). Later sources name Ambrosius Aurelianus as Arthur’s uncle, the brother of his father. Unfortunately for Arthur, the sources that actually connect him with the battle come much later, and their accounts are so fanciful that one cannot reasonably take them at face value. Historia Brittonum, for example, indicates that Arthur personally slew 960 men in a single charge (though other sources scale this number back to a more modest figure in the mid to upper 400’s). (Mommsen). Simply put, other notable historical documents of that time, including the Gallic Chronicles and Bede’s Ecclesiastical History of the English People, do not mention Arthur, though they both comment on the Saxon invasion of Britain and Bede specifically makes reference to the “siege of Mount Badon, when they made no small slaughter of those invaders” (Bede). It seems doubtful that there was a historical King Arthur. The contemporary sources simply don’t reference him, while the later sources represent him in a way that is clearly more folklore than fact. If there was a historical Arthur, it seems very likely that Badon Hill would be the key event to tie him to, being an actual event that would be a pivotal moment in the events Arthur is described as being central to (the halt of Saxon encroachment and the unifying of Britain). However, as this battle is impossible to accurately place in time and space and as details of the battle from contemporary sources are effectively nonexistent, at least with the records we currently have, this pursuit is futile. And it is quite certain that if there ever was a King Arthur the accomplishments attributed to him are largely fictitious. Vermaat, Robert. “Gildas (early sixth century AD).” Vortigern Studies. http://www.vortigernstudies.org.uk/artsou/gildas.htm (accessed November 3, 2018). “Battle of Badon.” Wikipedia. https://en.wikipedia.org/wiki/Battle_of_Badon (accessed November 3, 2018). Korrel, Peter. “Arthur, Modred, and Guinevere in the historical records and in the legendary Arthurian material in the early Welsh tradition”, An Arthurian Triangle: A Study of the Origin, Development, and Characterization of Arthur, Guinevere, and Modred. Brill Archive, 1984. Mommsen, Theodore (ed.) Historia Brittonum. Accessed 7 Feb 2013. One remarkable, though quickly refuted, artifact is the Artognou stone, discovered in 1998 at Cornwall, United Kingdom. The inscriptions on the stone read, as translated by the Celtic Inscribed Stones Project, “Artognou descendant of Patern[us] Colus made (this). Colus made (this).” (Wikipedia). Because “Artognou” bears semblance to “Arthur,” many parties, including the media, mistakenly referred to the artifact as the “Arthur stone.” Additionally, the stone was dated back to the approximate time period in which Arthur is reputed to have lived, if he did. Despite these commonalities, scholars have rejected the notion that the stone is related to the historic King Arthur in any way. Perhaps one of the contributing factors to this rejection is the fact that the stone does not appear to be an official inscription, rather a work of graffiti, as the carvings are shallow and untidy. Another artifact, also refuted, is the Glastonbury cross. In 1184, at Glastonbury Abbey, fire destroyed the monasteries. While reconstruction was underway, visits to the abbey declined, that is until the burial place of King Arthur and Queen Guinevere was reportedly discovered, alongside a leaden cross that read: Hic jacet sepultus inclitus rex Arthurus in insula Avalonia (“Here lies interred the famous King Arthur on the Isle of Avalon“). (Wikipedia). In retrospect, this incidence has been dismissed by scholars and historians as nothing more than a publicity stunt by the abbey to attract visitors (Britannia History). Most recently, a castle was discovered on the Tintagel peninsula in Cornwall. This structure evidently housed noblemen of the area, based on the additional findings of fancy, imported food utensils, such as plates from North Africa and glass cups from France (Daley). Most relevant to the legend of King Arthur, however, is the fact that this structure lines up with the writings of Geoffrey of Monmouth, who wrote History of the Kings of Britain in 1138. Geoffrey claims that King Arthur was either conceived or born in the same area that this high-profile structure has been discovered (Huber). In discoveries such as this, it is important for researchers to objectively analyze what they have found, rather than seek to connect their findings to King Arthur. Prematurely claiming Arthurian ties without backing evidence only encourages the spread of misinformation among both media and scholarly works. Such has been the case with the Tintagel excavation: the slightest inkling of possible ties to King Arthur are ran with, and facts becomes muddled (Proctor). Based on these artifacts, evidence for the historical King Arthur is rather shaky. The castle-like structure carries the most weight, as Geoffrey of Monmouth described a similar location for the origin of Arthur. Altogether, however, physical evidence for King Arthur is about as convincing as the written and spoken testaments of his existence. The evidence, or lack thereof, points towards King Arthur existing only in legend. Ambrosius Aurelianus was a 5th century Roman leader in Britain. From the writings of Gildas it can be determined that he was noble or descended from nobles, and most likely a Christian as Gildas said that he won his battles “with the help of God.” Had he not been a Christian, the author would likely have neglected to mention him at all, or at least not by name. Based on a record of Saxon conflicts by Bede, it is generally accepted that his parents and many of his people were killed in an early invasion. According to Gildas, Ambrosius organized the survivors and defeated the Saxons, though this is disputed by other historical records which claim multiple battles were fought, with both sides claiming victories. In Historia Brittonum, written by Nenius, Ambrosius morphed into a semi-mythical character who warns the hero Vortigern about dragons. Some believe Geoffery of Monmouth took some of this character’s superhuman attributes and changed his name to Merlin in his work History of the Kings of Britain. In Latin, Merlin’s name is given as Ambrosius Merlinus. Based on Geoffery’s writings however, Ambrosius would have been too old to have fought in Arthur’s battles. He would have been around 70 years old when Arthur should have fought at Camalan. Based on this information, some people have concluded that Ambrosius is not Arthur, but his name and some of his deeds may have become mixed up in the Arthurian legends. Some have speculated that there were two men named Ambrosius, possibly an older and younger brother, one who fought against Vortigern in battles often attributed to Uther, and another who fought against the Saxons in the 5th century. This is unlikely however, as historical sources have only ever alluded to one Ambrosius. Hunter-Mann, Kurt. “The Last of the Romans: The Life and Times of Ambrosius Aurelianus.” The Heroic Age, no. 4 (2001). Accessed November 5, 2018. https://www.heroicage.org/issues/4/Hunter-Mann.html. “Ambrosius Aurelianus.” Britannia. Accessed November 5, 2018. http://www.britannia.com/history/biographies/ambros.html. “Ambrosius Aurelianus.” New World Encyclopedia. Accessed November 5, 2018. http://www.newworldencyclopedia.org/entry/Ambrosius_Aurelianus. Lydwien, Charlotte. “Who Was King Arthur?” 2010. Accessed November 5, 2018. http://www.lydwien.nl/kingarthur/ambrosius.htm. Was King Arthur based on Jesus? I personally do not believe this is true, but it’s important to consider. The Annales Cambriae mentions Arthur carrying a cross for 3 days and 3 nights in year 516. This could potentially be a retelling of Jesus carrying his cross and being resurrected on the third day. Mordred is a man who betrayed Arthur. In year 537 they mention Arthur and Mordred dying. Mordred could be based on Judas who betrayed Jesus before he was crucified. The knights of the round table could be Christ’s apostles. There are many reasons why I don’t believe Arthur was based on Christ. Thus said Arthur, noblest of kings: ‘See ye, my Britons, here beside us, our full foes,–Christ destroy them!’ In this legend Arthur is mentioning Christ. It’s strange that legends would refer to him mentioning the person he’s based on. Most of the rest of Arthur’s stories don’t relate much to Jesus himself. It’s more likely he’s based on other religious figures such as saint Armel. Saint Armel was a prince who established some churches, retired as a monk, and even had rumors of slaying a dragon. While not talking about Arthur himself, there’s a quote that says, “to have such apostles for leaders was to have Christ Himself fighting in the camp.” The people may have thought similarly of Arthur and it’s possible that while not being based directly off Jesus, Arthur was a religiously impactful leader. Based on the widespread popularity of the Arthurian Legends across many cultures, it is my belief that the historicity of Arthur was created from many different historical, mythical, and religious figures. Due to the larger than life nature of Arthur’s feats, it seems unlikely that they were all completed by one man, let alone in one very short medieval lifetime. There are also evidences of the mixing of religious and mythological themes along with the historically accepted battles, guesstimated timelines and locations. The story of Arthur is popular in not only the Celtic traditions, but is claimed by the Romans and Scottish as well. One thing is for certain, the idea of a brave and just king was popular. Add to that, the heroic journeys, epic battles, and magical elements to his story, there is little to rival such a romantic telling of history. Let’s face it, the middle ages were no picnic to have lived through. If the story of the legendary King Arthur was made up of only facts, it likely would not have endured through the ages. There is something about the ethereal mythical properties of the tale that linger in the imaginations of men and women throughout the ages. It is no wonder that the legend itself has gained a form of immortality, much like Arthur does in some versions of the story. ASHE, GEOFFREY. “The Origins of the Arthurian Legend.” Arthuriana 5, no. 3 (1995): 1-24. http://www.jstor.org/stable/27869122. Crawford, Deborah. “St. Joseph in Britain: Reconsidering the Legends, Part I.” Folklore 104, no. 1/2 (1993): 86-98. http://www.jstor.org/stable/1260798. Littleton, C. Scott. “The Holy Grail, the Cauldron of Annwn, and the Nartyamonga: A Further Note on the Sarmatian Connection.” The Journal of American Folklore 92, no. 365 (1979): 326-33. doi:10.2307/539418.